Founded in a converted factory building in the Ironbound neighborhood of Newark, NJ, Gallery Aferro was planned as a pilot project to be recreated in different architectural forms, in multiple American cities. 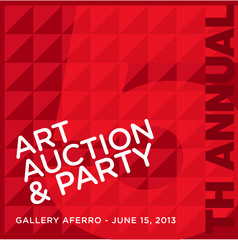 Gallery Aferro is currently being run out of a donated 20,000 sq ft, 4 story building in downtown Newark, NJ. The mission of Gallery Aferro is to bring cultural education and aesthetic engagement with contemporary issues to all people equally, and to create an environment where artists can gather and share physical and intellectual resources. We are working towards an arts community that is available to everyone, without sacrificing standards or quality of experience. Two floors of our building are devoted to exhibitions taking place in our Main Gallery, Project Room, Liminal Space and New Media Room. The Project Room and Liminal Space are reserved primarily for solo exhibitions by alumni studio residents. Gallery Aferro’s year-round residency program serves artists by offering large studios to continue or create ambitious work. 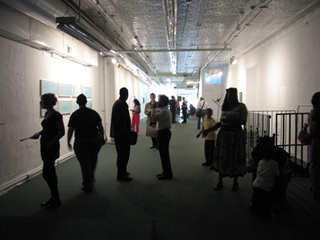 Selection is based on a demonstrated commitment to chosen field, especially in the face of financial or other personal disadvantage, excellence of artwork, an interest in engaging with the public via one’s art-making process, and by the probable effect of the program as allowing art-making that otherwise would not have been possible to occur. Educational offerings consist of tours, demonstrations and talks for K-12, college or other groups, and Identity Blueprint, our program for young women from Newark's Public Schools (grades 10-12), offering 3 months of free workshops in cyanotype photography and digital animation. Our publishing line is now on Publication No. 19, and consists of exhibition catalogs, original essays, artist books, educational handouts, and a sound art CD. Art Shop, on the ground floor, offers a curated selection of artist multiples and unique handmade items, encouraging civic pride and offering income opportunities for artisans. Art Shop is open during regular gallery hours. Please contact us if you are interested in having a tour, lecture or demonstration arranged for your group. All ages are welcome. Gallery directors Evonne M. Davis and Emma Wilcox will share a presentation with your group, demonstrate interactive pieces, and make themselves, the artists and art professionals available to answer questions and discuss the exhibition and contemporary art in general. We gratefully acknowledge the support of our funders, sponsors and the individual donors who make our programs possible.